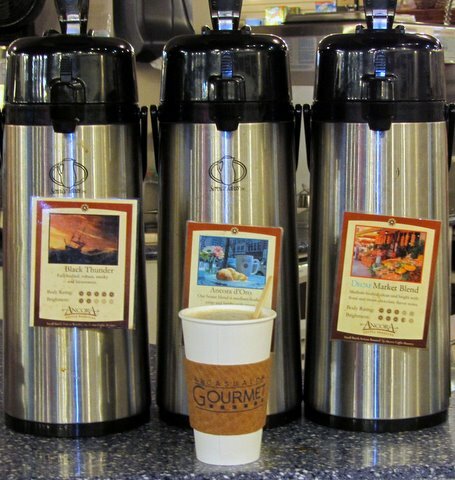 The wind-swirled rain this morning encouraged the Ancient Gardener to stop at Casual Gourmet in Glenwood for a cup o’ joe after his exercise routine in the fitness room and his half-hour walk in the gym at the nearby community center. The warming cup reminded the Ancient Gardener of four gardening reasons to buy this special treat. Reason 1: Use the cup next spring to start tomato or other seeds. Reason 2: Use the wooden stirrer as a row marker. Reason 3: Use the cardboard insulator to wrap around the stem of a tomato transplant to stymie cut worms. Reason 4: If you stop at a Starbucks, pick up a free 5-pound bag of coffee grounds to add as a soil supplement. If the “Grounds for Your Garden” basket is empty, ask a barista how you can get a bag or two. One is amusing, frugal, and possibly Scottish! The Ancient Gardener is sometimes amusing, more frequently frugal, and definitely Scot-Irish, with emphasis on Scot except when potatoes are concerned. interesting – I didn't think there was anything out in Glenwood besides my parents house. When you're visiting your parents some time, check out Casual Gourmet. It's a little place but has lots of quality kitchen stuff–like you'd find in such a shop at a huge mall. But this is just across the street from the new school. If you get there before 8 in the morning, you can get a medium cup o' joe for $1 with a few pennies change. They also have crepes and bagals. The wonder is how the shop will survive in rural residential Glenwood, just a mile south of I-70.